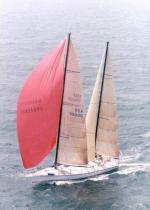 Alato was built in 1988 in California. 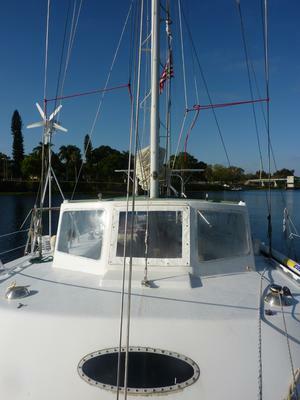 She is an epoxy impregnated wood, center cockpit cruising trimaran, and having been built by an experienced builder with great care, this is the best existing example of a Searunner 34. 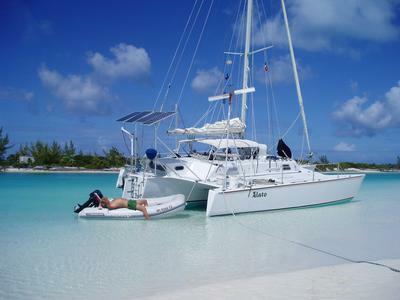 In addition, since 2005 we have owned and cruised her in the Bahamas, and have extensively upgraded her and her systems for comfortable live-aboard life and safe comfortable passage making. The list goes on and on, with high end additions to give us efficient and comfortable cruising conditions. The only reason we are selling Alato is because of medical reasons. 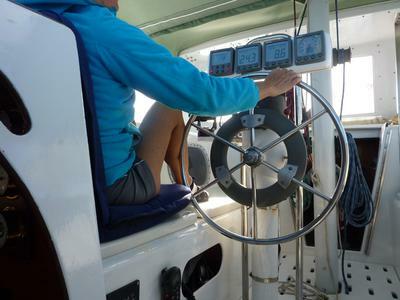 We are looking for someone who will be as excited as we were to discover this shallow draft, fast way of cruising at a reasonable budget. We read "The Case For The Cruising Trimaran" and when we found this boat and set her up with good lighting and a watermaker, new cushions and so much else, we have been truly delighted with her performance and have enjoyed months and months aboard. We are non-smokers, no pets, and very detailed people and all this shows in the condition of the boat. 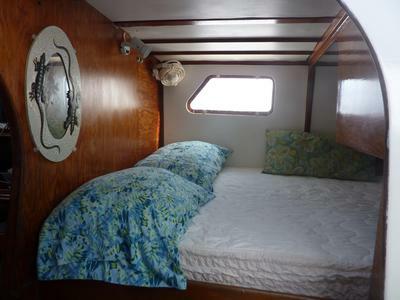 The galley has hot and cold running water sink, and an oven and two burner gimballed stove. There is so much storage in the galley, and lots of extra stowage room in the amas for fenders, rollup paddle board, scuba equipment etc. Alato is 34 ft long and 19.5 ft wide with a draft of 3'2". The mast is 47 ft off the water for a bridge clearance that works anywhere on the intercoastal waterway and through Lake Okechobee. If you are interested in more information, please feel free to call us at 616-836-0306 or at home 269-543-4362. 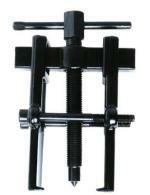 We will be happy to give you all the information, send you a copy of the survey, and send you more pictures. Alato is on the hard in Labelle, Florida. We plan to be at the boat in Florida in December. Contact person: Captain Mort van Howe. I too am interested in if Alto is still for sale and any additional photos? Very nice and very interesting. Some more pics? I'm glad & sad at the same time: Glad to see an Saling boat like this one - so BELOVEDLY prepared - for sale (I hope someone could be happy with it)... And Sad for you and your medicals reasons... Is really SAD to BE AWAY from the BELOVED SEA... I FEEL that by ALL MY LIFE... I hope you can be less sad knowing that YOUR 'ALATO' continues YOUR journey anyway, anywhere... I,as an "eternal first voyager marine"..
Hope to be possible to contact you to develop a project of my to, eventually, put it into what her and into world's market by a KIT ... Call me if you are interested, by email zen2you@outlook.com. I live in Brazil. The Searunner 34 was designed after we had some ten years of trans-ocean experience with the earlier four Searunner sizes, and so it is the zenith boat in the series, stronger, faster and more mature in several respects. I have seen ALATO in her cruising mode, with her quintessential, shellback, man and wife crew, and can attest that the vessel (if no longer her crew) is "fully found and in all respects ready for sea." She is probably the finest Searunner I have ever seen, and if I could I would have her for my own. A rare opportunity to buy a well-equipped cruising trimaran at what appears to be a reasonable price.